A New England tradition, our Anadama Rolls combine cornmeal and molasses to create amazing flavor you will want to taste time and again. Once upon a time in the village of Rockport, Massachusetts, there was an old fisherman whose lazy wife always gave him steamed cornmeal mush and molasses for dinner. One day, when he returned from working on his boat, he went home only to find the same meal yet again. Angrily, he cursed his wife as he mixed his mush and molasses with flour and yeast, then shoved it in the oven and baked it. The bread was so delicious, he shared it with his neighbors and they began baking it too. Since that time, the recipe has been passed among friends, handed down from one generation to the next. When we first served these ultimate rolls to our guests, everyone was delighted and begged us to make them again. Now, once a year, we prepare them for our annual formal dinner. Flaky and delicious, our Anadama Rolls deliver a warm contrast of flavors that are quite addictive. Admittedly, they are a process to make and probably aren’t for beginner bakers, but they are definitely worth the time and effort it takes to prepare them. Serve them warm and lather them with Whipped Cinnamon Honey Butter for an extra special treat. Bring milk, 1 cup water and salt to boil in heavy large saucepan over medium heat. Slowly whisk in cornmeal. Cook until mixture thickens and boils, whisking constantly, about 2 minutes. Remove from heat. Whisk in molasses and 2 tablespoons butter. Transfer mixture to a large bowl. Cool until thermometer inserted into center of mixture registers 115°F, whisking often, about 15 minutes. Pour 1/2 cup warm water into small bowl, sprinkle yeast over. Let stand until yeast dissolves and top looks spongy, about 13 minutes. Stir yeast mixture into cornmeal mixture. Gradually mix in 4 3/4 cups flour, about 1 cup at a time, to form soft dough that pulls away from sides of bowl. Sprinkle 1/4 cup flour onto work surface. Turn dough out onto floured surface, knead until smooth and elastic, sprinkling with more flour by tablespoonfuls if needed, about 10 minutes (dough will remain slightly sticky). Form dough into ball. Coat large bowl with 1 tablespoon butter. Add dough to bowl and turn to coat dough with butter. Cover bowl with plastic wrap. Let dough rise in warm draft-free area until doubled in volume, about 1 hour 15 minutes. Coat each of two 9-inch-diameter cake pans with 1/2 tablespoon butter. Roll dough into 18-inch-long log. Cut into 18 equal pieces. Using floured hands, form each dough piece into ball. Place 9 dough balls in each pan, spacing apart. Cover each pan loosely with towel. Let rolls stand in warm draft-free area until almost doubled in volume, about 30 minutes. Position rack in center of oven and preheat to 400°F. Melt 2 tablespoons butter in small saucepan over medium heat. Brush top of rolls with melted butter, then sprinkle with sesame or poppy seeds. Place rolls in oven and immediately reduce temperature to 350°F. 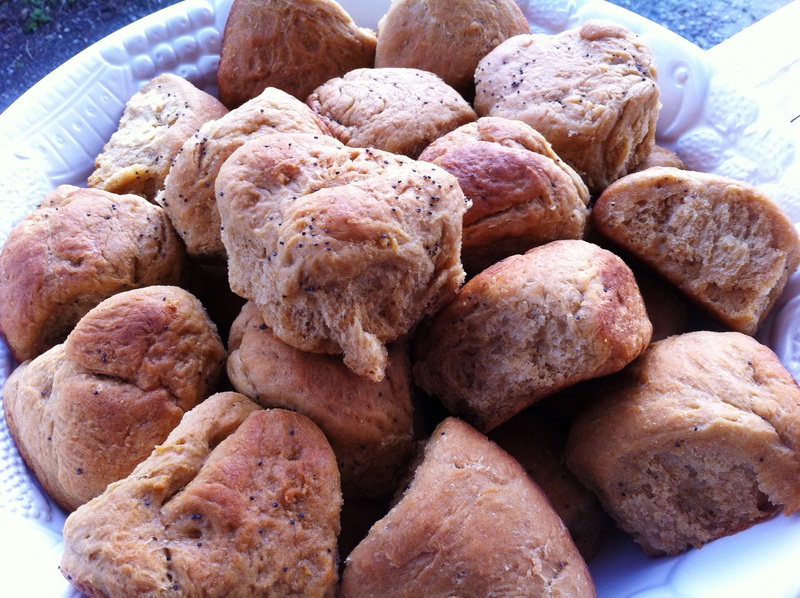 Bake rolls until golden brown, about 30 minutes. Serve warm. TIPS: Can be made 1 day ahead. Cool completely and store airtight at room temperature. Wrap rolls in foil and rewarm in 350°F oven 10 minutes.